Don't Pull Those Signs Down! 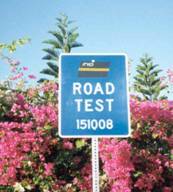 In spring 2009, the Long Term Pavement Performance (LTPP) program will resume monitoring as many as 600 test sections. So, please do not pull the LTPP signs down. Depending on budget and the willingness from our State partners to continue monitoring the test sections, annual data collection activities for these test sections may continue through 2015. The criteria for continued monitoring of a test section are based on experimental design, data set completion, and the fact that many test sections have not reached the end of their design life. LTPP understands that some test sections may need some type of maintenance treatment or rehabilitation work and will go out-of-study. However, for those test sections that will receive only minor maintenance treatments during the next six years, LTPP requests that you continue to maintain these test sections. For those sections that will be overlayed or rehabilitated between now and 2015, we would like to be notified so that we can collect one last data point for the performance curve prior to the treatment. You ask, what is involved with my agency maintaining the test sections? First of all, each LTPP State Coordinator should contact the appropriate offices within their agency to determine the current status of the LTPP test sections for their State. In particular, the State Coordinator should find out if any work was performed at a test section that has gone unreported, and do a field check to make sure the LTPP signs are still up and pavement markings are in good condition. LTPP recognizes that it may be imposing on your already limited staff to do this field visit, but it will be more costly to the program if contractors are sent to collect pavement performance data for a test section they can no longer find or to a test section that has been rehabilitated. So, your help in this initial effort to properly identify test sections for continued monitoring is very important and appreciated. In addition, the program still needs your support in providing traffic control for the monitoring activities. The LTPP regional support contractor for your State will contact you regarding the status of LTPP test sections in your State. You can also contact the regional support contractor for your State, by going to https://www.fhwa.dot.gov/pavement/ltpp/whoswho.cfm. As mentioned in the Fall 2007 LTPP Newsletter, because of budget reductions to the program, some of the original activities of the LTPP program will not be completed by 2009. The Federal Highway Administration (FHWA) management has developed a plan so that some of the activities not completed by this date continue past 2009. Thus, continued monitoring is one of the incomplete activities that will start now. There will be a presentation titled "What's Next for LTPP Test Sections" at the upcoming LTPP State Coordinator's Meeting at the Transportation Research Board's (TRB) Annual Meeting in January that will give more detail on the test sections identified for continued monitoring and the future for the test sections still in-service. For more information, contact Aramis López at aramis.lopez@fhwa.dot.gov or phone (202) 493-3145. While the majority of LTPP data is measured data, some of it is calculated using computed parameters or summary statistics derived from raw LTPP data, e.g., IRI (derived from longitudinal profile data), various rut indices (derived from transverse profile data), or backcalculated moduli (derived from pavement deflection data and supplemented by pavement cross-section information). The availability of these computed parameters expedite and improve the efficiency of many analysis projects. A recently updated calculation is the frost data computed parameter. To monitor the freeze penetration in base, subbase, and subgrade of pavements, LTPP instrumented selected test sections in the Seasonal Monitoring Program (SMP) with subsurface electrical resistivity probes and temperature probes. In 1997 the first SMP data were extracted from the LTPP database to identify, through interpretation, the locations of subsurface frost in unbound materials. The analysis results of this initial study are documented in the research report Determination of Frost Penetration in LTPP Sections, Final Report (FHWA-RD-99-088). As the pavement design process moves toward mechanistic-empirical techniques, knowledge of seasonal changes in pavement structural characteristics becomes critical. Specifically, frost penetration information is necessary for determining the effect of freeze and thaw on pavement structural responses. Figure 1. Locations of the LTPP SMP sites analyzed in this study. With the completion of monitoring measurements on the SMP sections in October 2004, there was a need to complete the interpretation of measurements not previously interpreted and add the results to the LTPP database. Consequently, a study was conducted to complete the interpretations of frost penetration in unbound pavement layers and subgrade soil using temperature, electrical resistivity, and moisture data collected for instrumented LTPP SMP sites. This study was completed in April 2008, and the final report, LTPP Computed Parameter: Frost Penetration (FHWA-HRT-08-057) was published this month. Printed copies are available and a PDF version will also be available on the LTPP web site soon. This new data will be available to the public in Standard Data Release 23 (January 2009). Periodically, LTPP will share database tips to give its users a better understanding of how the database works. This issue gives you, the user, tips on how to use data from LTPP's Seasonal Monitoring Program (SMP) and the various types of analyses the data can support. The seasonal study was designed to measure the impact of daily and seasonal temperature and moisture changes on pavement structures and response to loads. Sixty-four test sections were selected from the General Pavement Study and the Specific Pavement Study (SPS) experiments to monitor temperature and moisture. For these sections, the frequency for collecting distress, deflection, and longitudinal profile data was increased. Measurements specific to sections in the seasonal study were made using devices such as Time-Domain Reflectometry which measures subsurface moisture changes; Thermistor Probes which track subsurface temperature changes; and Electrical Resistivity which measures frost/thaw depth. Analysis of the SMP data is not an easy task because of the number of database tables involved and the pavement engineering acumen necessary to interpret the data. To-date, SMP data has been used in studies to predict changes in the subsurface temperature and moisture contents using the thermodynamic models in the Enhanced Integrated Climatic Model used in the new pavement Mechanistic Empirical Design Guide. One may find the estimates of coefficients and other inputs used in those models in the LTPP Computed Parameter: Frost Penetration (FHWA-HRT-08-57) and Seasonal Variations in the Moduli of Unbound Pavement Layers (FHWA-HRT-04-079) reports. The results presented in these reports will likely make analysis of the SMP data a little easier. It is recommended that these reports be reviewed prior to starting any analysis effort on SMP data. Others potential uses of SMP data include relating seasonal changes in pavement roughness to the impact that frost has on falling weight deflectometer backcalculation methods and results. These are just a few examples of how this valuable data can be used. The SMP data is found in the SMP module. There are over 30 tables in the SMP module and data from SMP test sections are contained in just about all other data modules. So finding SMP data requires reference to the entire database. Watch for more database tips in upcoming issues. The next release of the LTPP database will be distributed at the 88th Annual TRB Meeting in January 2009. Standard Data Release (SDR) 23 will include formal release of level 1 TRF_MEPDG* inputs, a new table that presents the layer structure for each test section, computed frost and depth data for the seasonal monitoring sites, and updated climate and SPS test section coordinates data. To get your copy of this release, visit the LTPP booth during TRB week. Otherwise, you can request a copy of SDR 23 by contacting the LTPP Customer Support Service Center at ltppinfo@fhwa.dot.gov or phone (202) 493-3035. Arizona SPS-5 to identify the cause of higher-than-expected rutting in the recycled sections. Ohio SPS-1 to try to determine why the project has many more pavement distresses than the SPS-9 project which is located in the same area as the SPS-1. New York SPS-8 because early pavement distresses were observed even though the project has no heavy loads traveling across it. Texas SPS-5 to determine why this project is performing substantially better than the surrounding pavement with similar pavement characteristics. In addition, reflection cracking and individual layer rutting were examined. The findings from these forensic investigations are being documented and are expected to be available next year from the LTPP Customer Support Service Center at ltppinfo@fhwa.dot.gov or phone (202) 493-3035. Although forensic investigations of other LTPP projects are not planned at this time, the FHWA is looking into the possibility of holding a forensic workshop for highway agencies and others in the pavement community to study and discuss state-of-the-art forensic procedures. For more information, contact Jack Springer at jack.springer@fhwa.dot.gov or phone (202) 493-3144. If you are in Washington, D.C. for the 2009 TRB Annual Meeting, please make plans to attend the LTPP State Coordinators' Meeting on Sunday, January 11 and the LTPP Box Session on Monday, January 12. What's Next for LTPP Test Sections? In addition, all attendees of the TRB Annual Meeting interested in analysis of pavement performance data are welcome to attend the TRB Data Analysis Working Group (DAWG), without registration or attendance fee, immediately prior to the opening of the meeting: Saturday, January 10, 2009, 9:00 a.m. - 6:00 p.m., Blue Room, Shoreham, Chairman Alex T. Visser, University of Pretoria, Presiding. More information is available from the TRB Announcement of the next DAWG Forum at the website: http://onlinepubs.trb.org/Onlinepubs/sp/DAWG_announcement_2007-0120.doc.